The stylish fox is back again, but this time on his luxurious yacht. Play Foxin Wins Again slot at Moon Games and thrive with the new features and flourishing bonuses. Spin away and see what the game has in store for you. The game consists of three key features that will set your bankroll on fire with major pay-outs and lush prizes! By landing 5 combination symbols on the grid, you will be awarded 1,000 coins! 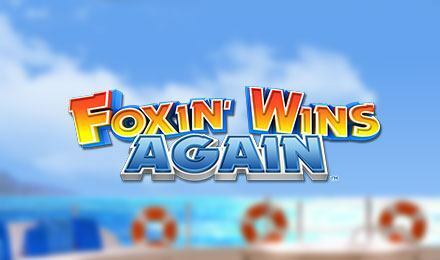 The Foxin Wins Again slot game is the sequel to Foxin Wins but modified and more appealing. The key features of the game are SuperBet, 10 Free Game Choice and the Free Game 2nd Chance. Stick around and see how rewarding the game gets. Pay-lines: All the pay-lines are fixed and cannot be altered. Stake/Line Value: Select your bet amount by clicking on the settings icon. Change your bid from the lowest coin values 0.01 to 1.00. Spin: Click the play button and watch the spinning start after having placed your bid. There are three bonus rounds in Foxin Wins Again, scroll below and find out how to trigger the features. This feature is activated when you click on the super bet icon on the right side of the reel. You can bet more coins to play the feature. Your winnings increase as per the SuperBet levels chosen by the fox pups which appear under the reel, jumping onto the grid to make wilds. Free games are awarded when 3 or more bell scatter symbols appear anywhere on the reels where all the prizes are doubled. The Free Game Feature is retriggered when you land more scatter symbols on the reel during the game play. Wins are added to the pay line and scatter winnings. When the Free Game Choice feature ends, you are prompted to either “Accept” the wins or “Replay” for higher prizes. The free game can be replayed once. Come play Foxin Wins Again at Moon Games and see why it is one of the best games for far!